now trading as WEST: West Auckland Enterprise,Skills and Training. Waitakere WEA is an independent, not for profit organisation established in West Auckland in 1976. It is a member of the Federation of Workers’ Educational Association in Aotearoa New Zealand (FWEA) whose history in New Zealand dates back to 1914. Waitakere WEA operates from a house in the centre of Henderson gifted to it in 2001 by Myra & Ritchie Gilmour. In 2014 WEA participated in a capability assessment process funded by MSD. As a result of these conversations we introduced a new look and clearer focus from 2015, becoming West Auckland Enterprise Skills and Training (W.E.S.T.). At WEST, we believe that a community can thrive when the individuals and businesses have enough money and resources to achieve economic wellbeing. WEST provide skills and training to access employment, increase employability, develop an existing business or start up idea, increase financial resilience and wellbeing, and provide support for initiatives that develop enterprising communities, where local residents, community groups, organisations and businesses contribute to & benefit from their local economy. WEST Driver Education – Driver Licence Preparation Courses to support people to prepare for and sit the Driver Licence tests. Courses include Learner Licence Theory Preparation, Restricted Licence Preparation, Full Licence Preparation, HV (Heavy Vehicle) Class 2 Theory Preparation Course, F Endorsement Forklift Certificate and OSH Operator Certificate. WEST Becoming Financially Fit – workshops and courses to support the community to ‘Become Financially Fit’ – a range of workshops to learn about your money personality, learn tried and tested ways to save and even make money, set goals and start paying off existing debt, start your savings goals and learn how to borrow sensibly and reduce or even eliminate future debt. WEST have some exciting BFF workshops coming up including ‘slow cooking on a budget’, ‘small appliance repair day’, ‘plus size clothing swap’, ‘sewing, mending and alterations’ classes and much more. Check out the WEST course and workshop calendar for a full list of WEST Becoming Financially Fit courses. Based at 9 Henderson Valley Road, close to rail and bus transport hubs, WEST works cooperatively with other community groups, organisations, and businesses. WEA has always believed that effective community development comes out of strong collaborative relationships. WEST will be continuing this focus and taking it to a new level of networking and enabling of community initiatives that support the North West of Auckland. WEST will explore opportunities for delivery of wider community based provision to support employability and skill development of the local community. WEST also supports community initiatives that support the economic wellbeing in the community. Convening the Housing Call to Action Network made up of people from the social service, Community, Central and Local Government, and Non-Government sector who have a shared interest in the Housing and Homelessness sector. 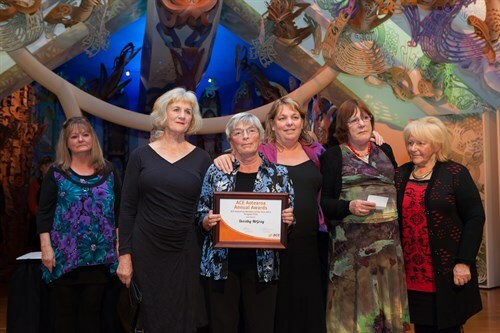 Dorothy McGray Waitakere WEA Coordinator 1987-2005, receives the ACE Aotearoa Award for 2014 for services to adult education. Judy Haldane, Jane Gilmour, Dorothy McGray and her daughter, Kathryn Keen and Gayle Marshall.